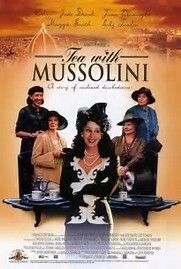 In 1999, Cher went the Merchant-Ivory route in TEA WITH MUSSOLINI, a very proper, genteel drama, said to be based on incidents in the early life of the UK-Italian co-production’s director, Franco Zeffirelli. No, Cher does not attempt an English accent, but appropriately plays a flamboyant American showgirl-turned-gold-digger, part of a mini-society of high-born ladies hanging around the piazzas of Florence, Italy, in the 1930s. Mostly English aristocrats - and mostly acted by grandes dammes of British drama such as Joan Plowright and Judi Dench - these aged Italophiles drink tea, throw parties, have affairs, pamper their dogs/children, visit Roman ruins, restore art frescoes, and otherwise have it pretty easy. Until the rise of strutting Nazi ally Benito Mussolini drags their precious Italy into fascism. Suddenly the streets swarm with black-shirted thugs who persecute Jews and imprison the harmless, dotty Englishwomen as foreign enemies. Still, their alpha female leader (Dame Maggie Smith) continues to trust and defend Mussolini, because her late husband was an ambassador to Italy, and she once drank tea with the dictator. Cher's low-caste character, once a virtual outcast among this clique, becomes their benefactor, their savior, their Scarlet Pimpernel in a flapper costume. At least until America enters the war and things start to look very grave indeed. But never so grave as they did in SAVING PRIVATE RYAN or even LIFE IS BEAUTIFUL, to name two genre contemporaries of this flick. TEA WITH MUSSOLINI is truly WWII lite, a sunny bonbon in which the bloody clouds of war are dispelled, in predictable fashion, by good grace, proper etiquette and a wee bit of heroic subversion. Going by this PG-rated production, you wouldn't even know that Mussolini himself came to a gory and sordid end. Hey, some of the greatest war dramas ever managed to avoid profanity or gore. But TEA WITH MUSSOLINI does tend to meander, surprisingly so for a script written for the rapier-witted dramatist John Mortimer (who created Rumpole of the Bailey). You never even quite know whose story this is supposed to be, as the narrative skips from Cher to Maggie to the transvestite kid (don't ask) to the Franco Zeffirelli stand-in, an illegitimate son of a wealthy Italian's mistress. The boy is raised by the little English colony and later gets to repay their indulgence.